SERVICING simple Papua New Guineans brings a blessing to small companies like the Desh Besh Enterprises Limited. Desh Besh Group, owned by Mohammad Wahed of Bangladesh origin, started in 1990 with aim of providing affordable goods and services to the grassroots people. Opening two supermarkets in the Gordon and Gerehu suburbs, Desh Besh has taken another stride to open its third wholesale and retail supermarket. 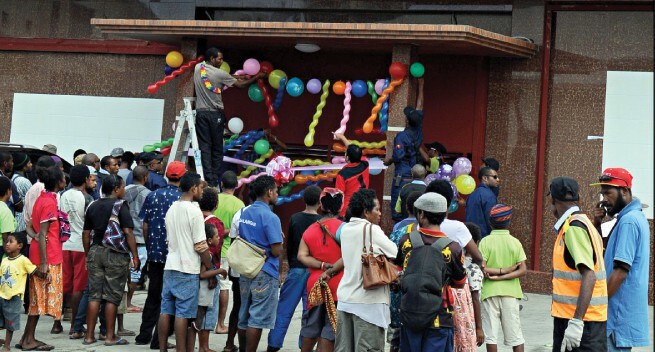 The group, which operates two wholesale stores, a clothing shop, one service station, a fast-food outlet, a bakery and a container trucking service, opened the doors to its third supermarket in Port Moresby yesterday. Located at Konedobu along the Lawes Road, the wholesale and retail shop opened its doors at a perfect time for residents from nearby communities. Mr Wahed said the location was chosen because Konedobu and the town area did not have affordable supermarkets for grassroots people. "Here, with all the big shops like Waterfront, Super Value Stores (SVS), the prices are high and the grassroots cannot afford them, so we are bringing this service to the grassroots; we are targeting the grassroots," he said. Mr Wahed revealed the latest project cost about K40 million and took three years to complete after going through processes for land acquisition, building construction and bringing the goods in for sale. He thanked the Bangladeshi community and the Motu-Koita community for their growing relationship and support. He also thanked other business, including the bankers, especially the Australia and New Zealand Bank (ANZ), whose help has made it possible for the steady growth of his business. "I am happy to tell you all that my company now employs close to 300 Papua New Guineans and the number is expected to increase once the supermarket and the upstairs departmental stores are in operational." The shop has three levels, ground level operates as a wholesale and retail, first level as departmental, second as office and stock space while the third level houses residential rooms for staff. The shop has already employed 70 customers, providing a bakery and kai shop area as well. "My company is a good corporate citizen of this country, paying taxes to the National Capital District and the National Government, and meaningfully contributing to the economic growth of this wonderful country." Mr Wahed aims to continue growing his business next year and onwards. "We are entering into a shipping company; we applied for a licence in August and should be in operations next year, probably around June.